Todd Rundgren’s band Utopia, with whom he released albums sporadically while maintaining a solo career (think Phil Collins and Genesis) explored both short-form pop and ambitious progressive-leaning rock. 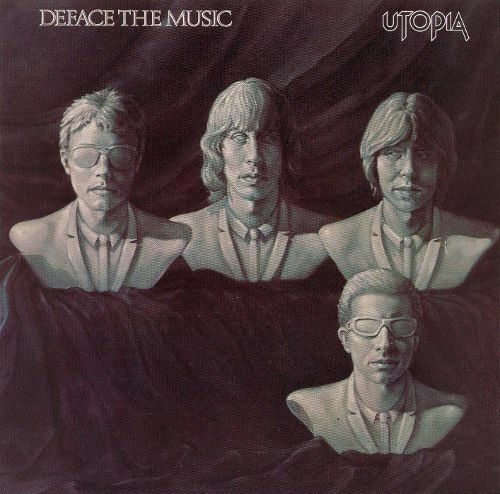 They also released one of the great Beatle parody works, their 1980 Deface the Music album. In the above Spinal Tap-esque retrofied video the band perform “I Just Want to Touch You” while evoking Ed Sullivan shows of yore and the “I Want to Hold Your Hand” Beatles era. Other tracks from Deface the Music explore later period Beatle tunes, sending up “Eleanor Rigby”, “Penny Lane” and others. Utopia were also responsible for the original recording of England Dan & John Ford Coley’s hit “Love is the Answer”, written by Rundgren.